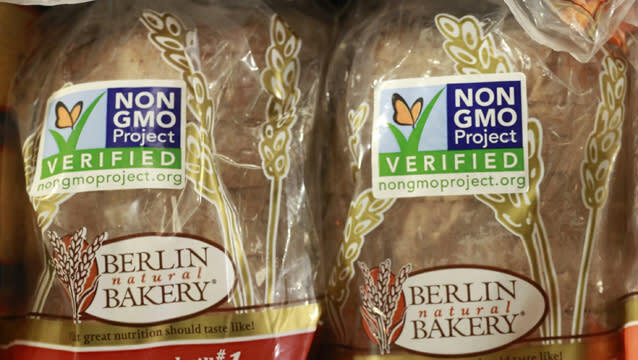 Opponents of genetically modified foods celebrated a new study this week that found pigs fed genetically modified grains were less healthy than pigs on a non-GMO diet. The team of Australian scientists and U.S. researchers divided 168 pigs into two groups: one fed a diet of genetically modified corn and soy; the other fed non-GMO grain. Over the span of 22.7 weeks, the pigs fed the genetically altered feed showed higher stomach inflammation. “This pig study is the first really sound study that has shown that there may be some damage to mammals, and pigs are very close structurally to humans, as a result of eating genetically modified foods,” says Mark Bittman, a food writer and columnist at The New York Times and author of the new book "VB6." Sixty-four countries either ban genetically engineered foods or require GMO labeling; the U.S. and Canada have no restrictions on GMO products. The most common foods that are genetically modified include corn, soy, cotton, papaya, alfalfa, sugar beets and canola. About 75 to 80 percent of U.S. processed foods contain GMO seeds, according to the Grocery Manufacturers Association. Related: Whole Foods CEO: If Syria Has GMO-Regulations, So Should the U.S.
Monsanto (MON) is the largest producer of GMO seeds and has spent millions of dollars fighting labeling legislation. Over Memorial Day weekend the “March Against Monsanto” protest attracted hundreds of thousands of people in 52 countries and 436 cities. The U.S. Department of Agriculture ruled last month that it needs more time to conduct detailed studies of new genetically modified corn, soybean and cotton seeds from Monsanto and Dow Chemical Co. (DOW) before approving their use in the food supply. These seeds "may significantly affect the quality of the human environment,” the USDA said in a statement. Dow has developed seeds that are engineered to tolerate applications of 2,4-D and dicamba herbicides by farmers. Monsanto’s soybean and cotton seeds are engineered to develop resistance to dicamba. More than 400,000 people petitioned the USDA to oppose the 2,4-D corn seeds; 2,4-D is a component of the highly-toxic chemical defoliant Agent Orange, which was used by the U.S. in Vietnam and has been linked to major health problems including cancer, lowered sperm counts, liver disease, and Parkinson’s disease. Bittman says U.S. consumers deserve the right to know what they’re eating and he disputes charges that GMO crops will help end world hunger or reduce food waste, an argument companies like Monsanto use in defense of their genetically engineered products. Is NSA Leaker Edward Snowden a Hero or a Traitor?